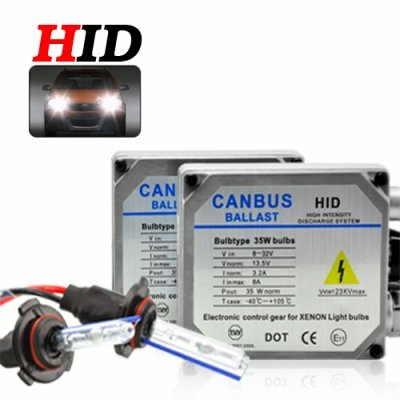 Successfully Added HID Xenon Headlight Kit (9005) - 8000K to your Shopping Cart. Visual clarity at night is only 5% of what it is during the day. As a result, the risk of an accident greatly increases. The situation is worse when driving in bad weather, especially in fog or storm conditions. However, you can greatly improve your clarity in these conditions by upgrading to a pair of these HID light bulbs. This Xenon kit uses 8000K HID lamps which create light that is very similar to natural daylight. Because of this you will not blind oncoming drivers, but you'll still be able to clearly view objects from a far away distance, easily read road signs, and navigate safely at night. With Chinavasion's market share in wholesale electronics, we're able to bring you factory prices on these high quality HID Xenon headlamp kits. Look on eBay and you will notice how identical kits sell for more than double the price of this one. If you are in the resale market then this is a good chance to make some great income without a lot of effort. The best part is that unlike our competitors, our CVJK-A57 HID Xenon kit actually comes with a 12 month guarantee! Order in bulk now while supplies last and we will express ship your package by tomorrow.